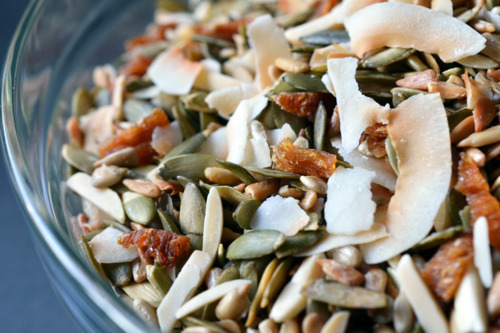 My hubby’s Paleo trail mix is like crack. The two of us constantly make beelines to the pantry to scarf down a handful or three throughout the day when we’re home. It’s super duper easy to make if you live near a Trader Joe’s, where you can purchase all the ingredients except for the flaked coconut, and have a handy-dandy scale. I love my scale. All you need to do is place a big mixing bowl on it, press tare (to zero the measurement), pour in an ingredient until it reaches the correct weight, tare it, and repeat with the next ingredient. No measuring cups to wash – just one damn bowl! When you’re finished weighing all the ingredients, you just mix everything together. I’m all about minimizing the prep and clean up. Make sure everything is unsalted – it makes a huge difference. A huge difference for the BETTER. Sounds easy, right? 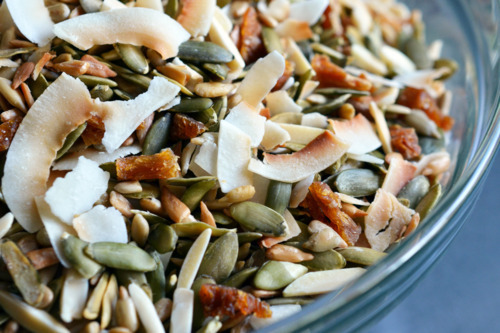 Go make some yourself and have some right out of the bowl or with coconut or almond milk. You’re welcome.